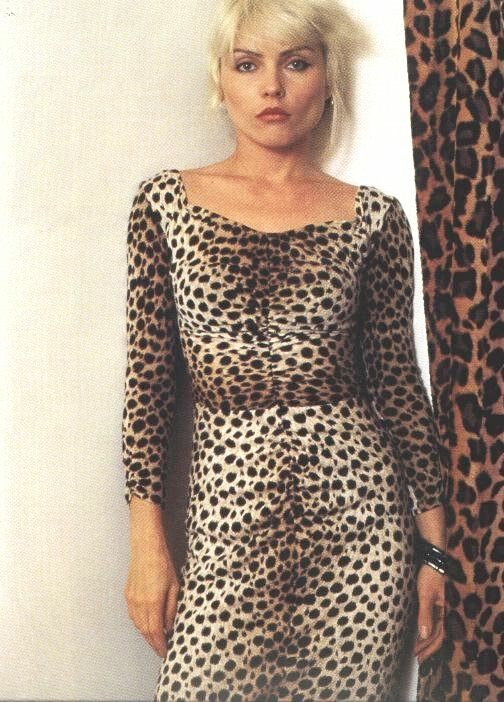 They don’t come much cooler than Debbie Harry do they? No; the answer is no. Devastatingly beautiful, with that creamy, cool voice and a nonchalance that every front woman since has tried to emulate – she’s part superhero if you ask me. So, obviously, my rock cake collection wouldn’t be complete without an ode to her, and as Blondie are celebrating their 40th anniversary this year, now is the time. This is no ordinary blondie recipe mind you, I went all out with leopard print white chocolate, rose petals and figs – a platinum Blondie, worthy of the capital B.
Preheat the oven to 180ºC / Gas Mark 4, then butter and line the bottom of your brownie pan. Melt the chocolate and butter together in a bowl over a pan of simmering water and allow to cool for about 5 mins. In a stand mixer, beat the eggs and salt until you start to see them frothing and then add the sugar and vanilla. Continue to beat until the mixture is really thick and creamy, this will take 5-6mins. Remove from the mixer and then stir through the melted chocolate and butter before gently folding through the flour. Finally, fold through the nuts and figs. Pour into your brownie tin and bake for around 45-50mins. The top will cook quickly so if you notice it starting to over colour, pop some foil over the top. If you like your brownies less gooey then you will want a cake tester to come out clean, but for a gooey finish, a little wet batter is a good idea. Leave to cool in the tin for about 10mins and then cut into squares. To make the leopard print triangles, melt two-thirds of the white chocolate gently to around 45ºC, then, off the heat, add the remaining chocolate to the bowl and stir until it melts. This reduces the temperature of the chocolate to around 31ºC and is known as tempering the chocolate. This will give a high shine finish to your decorations. Spread the melted chocolate over the transfer sheet (textured side up) and leave to set for about 5mins. Next score the triangles into the chocolate and allow to set completely in the fridge. Once set, peel off the transfer sheet and your triangles will be ready. 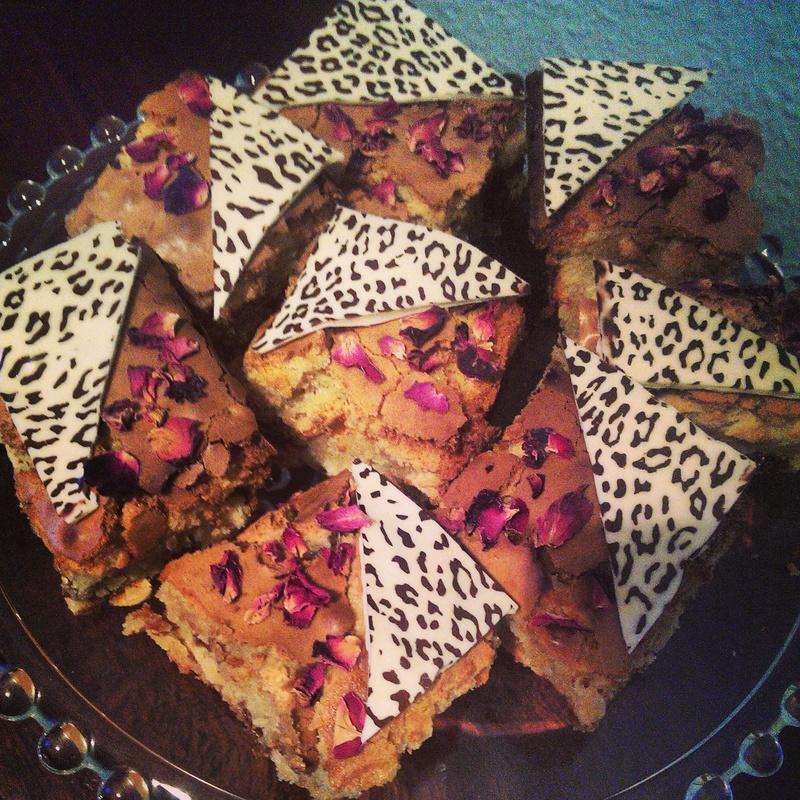 Using a tiny amount of the melted white chocolate, stick the triangles onto the blondies and sprinkle over the rose petals. Done. Debbie always wears it well. This entry was posted in Rock cakes, Tray bakes and tagged Blondie, blondie brownie recipe, blondie recipe, blondies, Debbie Harry, fig recipe, rose, white chocolate recipe by Natalie Glock. Bookmark the permalink.